In the kingdom of Sempera, time is currency—extracted from blood, bound to iron, and consumed to add time to one’s own lifespan. The rich aristocracy, like the Gerlings, tax the poor to the hilt, extending their own lives by centuries.No one resents the Gerlings more than Jules Ember. A decade ago, she and her father were servants at Everless, the Gerlings’ palatial estate, until a fateful accident forced them to flee in the dead of night. When Jules discovers that her father is dying, she knows that she must return to Everless to earn more time for him before she loses him forever. But going back to Everless brings more danger—and temptation—than Jules could have ever imagined. Soon she’s caught in a tangle of violent secrets and finds her heart torn between two people she thought she’d never see again. Her decisions have the power to change her fate—and the fate of time itself. I think what my favorite part about reading books by debut authors is that you are going into the story completely blind. Yes, one can start to have expectations based off the cover (yes I judge covers) and the synopsis but typically that does not sway my interest, at least not anymore. The concept of time being currency was fascinating to me. For someone who can not stand seeing blood, this would not be a world I would want to live in. I probably wouldn't last long, or I would do something to insult the aristocrats. However, I think Jules and I would get along. Jules has come to loathe the Gerlings ever since the night her and her father had to flee. However, due to unfortunate circumstances she must travel back to Everless. With danger waiting around every corner and the temptation of time on your hands Jules must hurry to save her father's life. But there is a past that Jules is unaware of and once in Everless she discovers more about herself that she would have ever thought. A secret that would bring certain death upon her if it were to be found out. There were many surprising twists and deaths that will leave you on the edge of your seats. I do have to say that some deaths were that emotional for me but I am sure in the future there will be some that will leave me a complete wreck. For those of you who may wanting that love interest, I will disappoint you by saying that there wasn't much of one. I know. There were moments but not enough to get your heart to flutter. Sara Holland writes a debut that is perfect for all fantasy lovers. Perfectly crafting a story where time is key to living and where new friendships can be both welcoming and deadly. 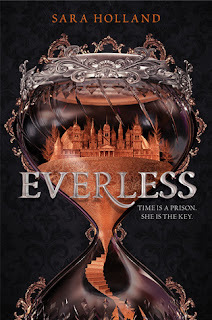 Everless is a creative debut full of adventure, magic and a story worth reading.